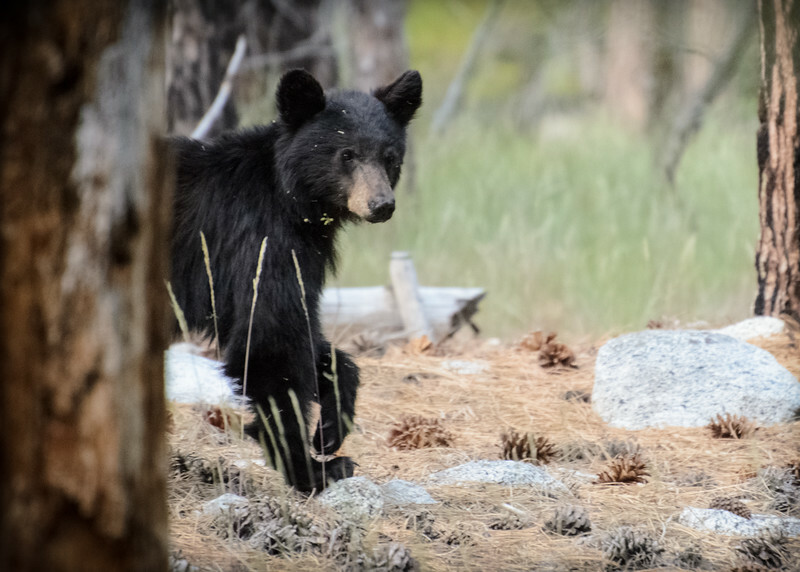 After some 19 years in California, I finally got a half-decent photo of a black bear; my earlier attempts were always blurred. This ain't a masterpiece. There are many technical flaws--too much noise, too shallow depth-of-field, muted colors. But other than a few small adjustments and a generous crop, I left as is. Yes, I could spend all day photoshopping and maybe get something marginally better, but you get the main point: I saw a bear in the woods. Memory preserved. Bada-bing! The bear was in Zumwalt Meadow in Kings Canyon National Park, btw. I've been to the area twice and both times saw a bear. This leads me to the conclusion that if you hang out at Zumwalt Meadow in the last couple of hours of the day, or perhaps early morning, you'll probably see a bear. I got this photo by slamming my telephoto lens on my camera, putting it on automatic and then spraying and praying while following the mighty bruin for a few minutes before he ditched me.